thaRpennaith thAnaRIyAnElum – even if he did not know me, as I am [ i.e. my true nature]. This AzhwAr has said of himself in thiruchchandha viruththam 90 “kulangaLAya IriraNdil onRilum piRandhilEn, nalangalAya naRkalaigaL nAlilum navinRilEn pulangaLaindhum venRilEn poRiyilEn” (I am not born in any of the four varNas (classification of society based on qualities and activities), I have not learnt any of the four vEdhas which show correct path to all, I have not won over the five senses and I am trapped in worldly pursuits such as Sabdham (sound) etc ). Even if emperumAn does not know that I have such faults…..
thAnaRiyAnElum – Just as mentioned in “yassarvagya: sarvavith” even if he, who is the omniscient, does not know my faults. ennaith thAnaRIyAnElum – Instead of saying ‘my faults’ why is AzhwAr saying ‘me’? Since AzhwAr feels that he is the epitome of all faults, he says ‘me’ instead of ‘my faults’. aRiyAnElum – has it not been mentioned “avigyAtha hi bhakthAnAm Agassu kamalEkshaNa:” (when it comes to the faults of his devotees, the lotus-eyed (emperumAn) remains ignorant)? 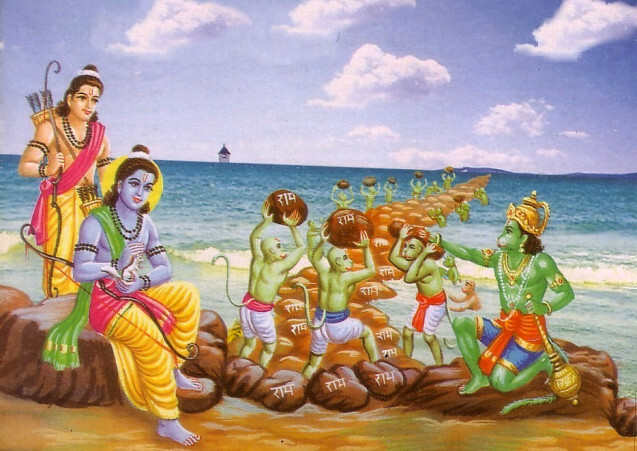 thadangadalaik kaRkoNdu thUrththa kadal vaNNan – he built a dam in the huge ocean with stones; he has dark and cool form, just like the ocean; he has qualities such as profundity etc similar to the ocean. He built a dam across the ocean with stones which would normally sink in the ocean, and achieved a feat which no one else can, in line with his quality of having agadithagatanA skill (achieving the impossible). AzhwAr says that emperumAn achieved such feats not only for pirAtti (sIthAppirAtti, for rescuing whom he built the dam) but also for me . . . .
eRkoNda vevvinaiyum nIngak kaNdu – when I was fully transformed like an insentient entity being enveloped by all the sins, he graced me such that all the sins ran helter skelter, just as mercifully mentioned by nammAzhwAr in periya thiruvandhAdhi “vAnO maRi kadalO mArudhamO thIyagamO kAnO orungiRRum kaNdilamAl” (How strange! After attaining emperumAn, we have not seen where the sins covering us went. Did they disappear in the sky or in the ocean or in the wind or in fire or in the forest?) vevvinai – cruel sins; some people split this as ev vinay – all the sins. vilangA manam kaNdu vaiththAn – he kept me in his mind through his sankalpa (divine will) and did not look at anything else. Just as nammAzhwAr has mercifully mentioned in periya thiruvandhAdhi 68 “kallum kanaikadalum vaigundha vAnAdum pullenRozhindhana” and periyAzhwAr in periyAzhwAr thirumozhi 5-4-9 “panikkadalil paLLigOLaip pazhagavittu Odivandhu ” emperumAn left everything else and thought only of me. aRiyAnElum – manam vaiththAn – even if emperumAn did not know my faults, he kept his mind on me. One who did not know, started knowing. One, who did not know my faults, multiplied my qualities ten times or hundred times and started engaging with me. One who is avigyAthA (one who does not know faults) became sahasrAmsu (knowing (qualities) thousand times) [from SrI vishNu sahasranAmam]. eEvvinaiyum mAyumAl – once he keeps his mind on me, is there any way by which the sins will not be destroyed? Thus, all sins such as bhagavathapachAram (disrespectful acts towards emperumAn), bhAgavathapachAram (disrespetful acts against emperumAn’s followers) and asahyApachAram (disrespectful acts against anyone without any reason) will get destroyed. The pathos behind this is that this is the agadithagatanA (doing the impossible) act carried out by emperumAn towards me. This entry was posted in iyaRpA, nAnmugan thiruvandhAdhi on September 4, 2018 by T N Krishnan.